Learning to read is a key skill for children and, believe it or not, they start practicing it since very early on. But what is literacy? It’s not only the ability to read, but also to write and learn. It includes comprehension and spelling. There are many skills and experiences that happen since birth that will make up the building blocks for a baby to be able to read later on. 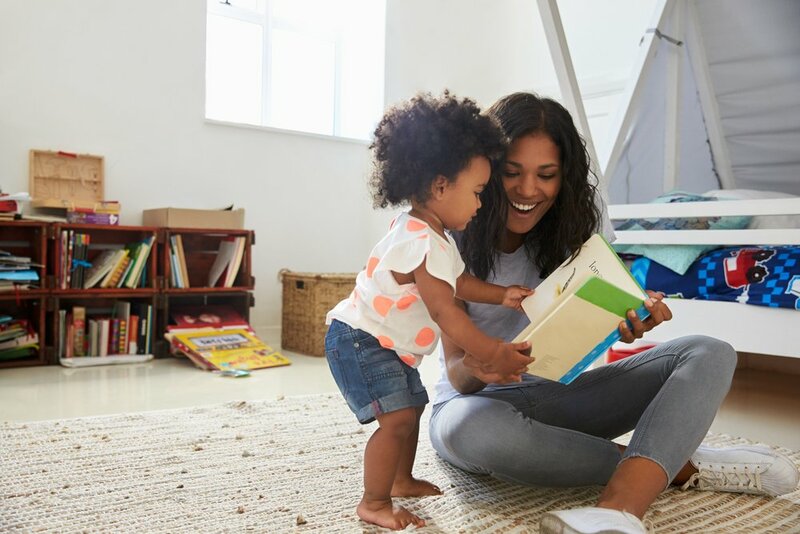 So, before being able to read, your little one will acquire listening skills to understand sound patterns when you sing, rhyme, and talk to her; she will develop her visual recognition, and will learn to associate what she hears with what she sees when you read books to her and show her pictures. Doing these activities is very relevant for future language development and literacy skills. Thus, literacy doesn’t begin at preschool or when your child starts learning the letters, but at home with you and with all the loving and caring interactions that happen between you two. So, what can you do at each stage to promote literacy skills? It’s never too early to read with your baby! You can spend quality time together and have fun while reading. Your little one will probably want to put in her mouth any book you give her! Still, sit comfortably with her on your lap and show her the book, letting her bang, chew, or turn the pages. Just having a book in her hands will help her get familiarized with reading materials. At this stage your little one will realize that books serve for so much more than just banging and chewing. She might explore them more carefully and bring them to you, so that you can read them for her. This is an exciting time! She’ll start to recognize images and you’ll be able to ask her questions about the story and relate them to her own life experiences. Soon your little one will surprise you with an answer to your inquires by pointing at the images or finishing your sentences! By now your little one will love to read with you the same book over and over again! She likes to feel in control, and predictability allows her that. Since she’s so keen on repetition, you can take advantage and establish a bedtime routine that includes reading with her. Plus, repeating will provide constant stimulations for language development, “hard-wiring” the brain circuits. In the end, the most important thing is that, while reading to your child, you’re teaching her to love books and stories, which will in turn motivate her to learn to read later on, even though this will be a very difficult task for her. So, don’t hesitate and start singing, talking, and reading to your baby! What’s behind a resilient child?